A beloved and prominent 76-year-old artist from Wayland died Wednesday after a car struck a deer and propelled the animal into his windshield in Weston. 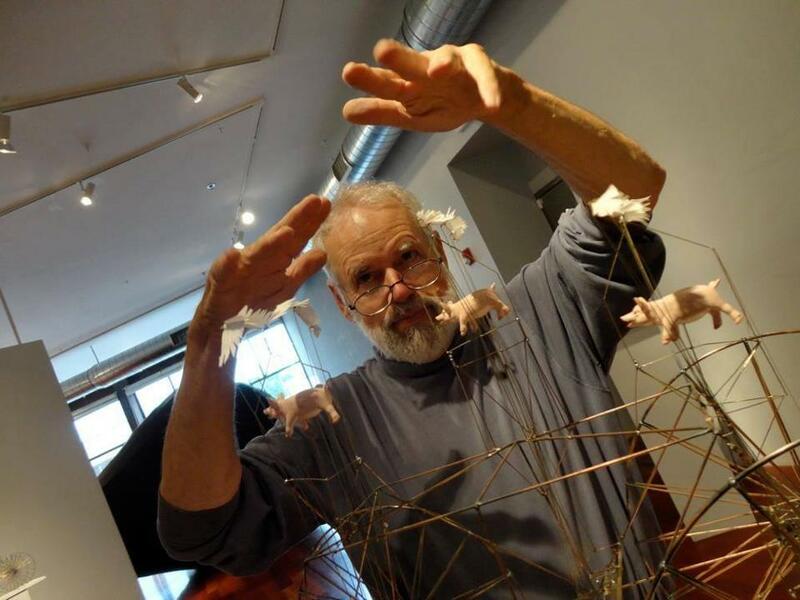 David A. Lang, a sculptor, painter, and photographer whose work was displayed at museums and universities in Greater Boston, was driving a minivan north on Wellesley Street around 5:25 p.m. when a sedan traveling in the opposite direction struck a deer, throwing it into his lane. The animal struck the windshield of the minivan. Lang was taken to Newton-Wellesley Hospital, where he later died from his injuries, authorities said. The Middlesex district attorney’s office, Weston police, and Massachusetts State Police are investigating. Lang exuded creativity, said his wife of 51 years, Kathleen Lang. For decades, Lang was head of the art department at Middlesex School in Concord, where he would guide students in the rebuilding of sports cars to help them understand physics, his wife said. He never stopped teaching or creating, she said. Lang was a founding member of the Danforth Art Museum in Framingham and in years past had taught at Dana Hall School in Wellesley and the deCordova Sculpture Park and Museum in Lincoln. Over the past 10 years, his work was displayed at art associations in Cambridge and Concord, the Peabody Essex Museum in Salem, the Fuller Craft Museum in Brockton, Regis College in Weston, and the University of Massachusetts Lowell, according to his website. At the time of his death, he was an artist member at the Boston Sculptors Gallery, where his work was displayed several times in the past, and where he hoped to have another show this spring. “He was always a person who continued with his artist’s work,” she said. Lang, a father of two and grandfather of four, was a Long Island native who attended Massachusetts General Hospital’s school of medical illustration. He met his wife at Harvard University; she worked in the chemistry department, and he was hired as a medical illustrator. He loved Ireland, she said, particularly County Clare, and was looking to set up a photography exhibit in that country of images he captured at Irish horse shows, she said. He had a studio in Natick where he kept his machining tools for his sculptures. At home, he had studio space for watercolor paints. At his core, Lang was an inventor, Goslow said. He recalled a Lang sculpture that resembled an enormous bicycle made from wire. Another installation was an old radio Lang had wired to play broadcasts of old World Series games, including one that featured the Brooklyn Dodgers. Another piece included a pair of old boots that moved up and down. Josephine Martins, a critic for Artscope, reviewed his last publicly displayed work, a sculpture called “Journey” that was at Boston Sculptors Gallery in 2016. The piece was huge and kinetic, she said, with four wheels, a wooden man pedaling, and large white wings onto which different images were projected. Emily Sweeney and Travis Andersen of the Globe staff contributed to this report.